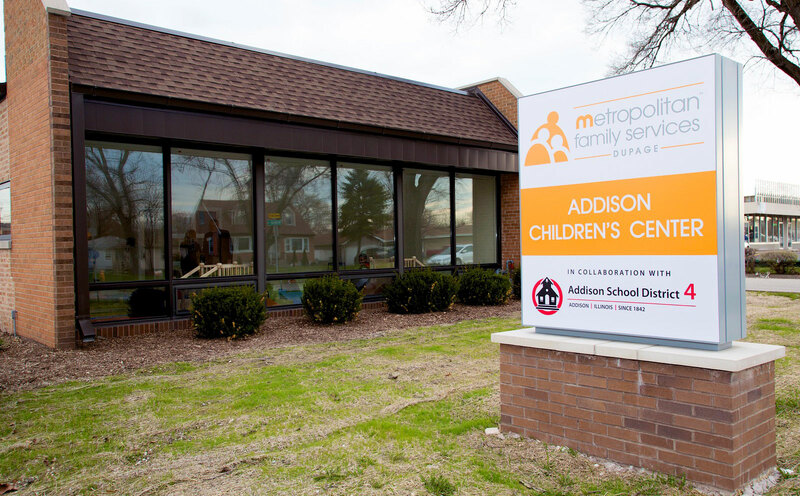 On April 13, 2016, Metropolitan Family Services DuPage and Addison School District 4 held an open house and ribbon cutting ceremony for the Addison Children’s Center, located at 121 E. Fullerton Avenue. The new center will provide high-quality early learning and child care for children ages six weeks to three years. Officials including John Langton, Superintendent of Schools, Addison School District 4, and Theresa Nihill, Executive Director of Metropolitan Family Services DuPage, were present. The Center positions Addison as one of the first communities in DuPage County to offer center-based early learning for children ages 0-3 years through a partnership between a nonprofit early childhood education provider and a school district. The facility will initially serve 16 infants and toddlers in a safe, welcoming and engaging space that fosters learning and growth for every child; another two classrooms will open later in the year. DuPage County currently faces a severe shortage of early learning opportunities — only two childcare centers currently operate in Addison, said Theresa Nihill, Executive Director of Metropolitan DuPage. As a result, many parents rely on unlicensed home facilities to care for their children, and the Addison Children’s Center will fill an important gap. The Addison Children Center features play spaces, areas for caregiving, a large indoor space for children’s motor skills development, and an outdoor playground. The Center’s high teacher/student radio is designed to give children focused support. There will be one teacher for every four infants/toddlers, and the maximum group size will be eight infants/toddlers, with two teachers. A teacher’s aide will be present in each classroom. Bilingual staff will partner with families to help meet goals for the children and their families. Chuck Wartman, Assistant Superintendent of the Addison School District, said he appreciates the opportunity to partner with Metropolitan. National research shows that for every dollar invested in Head Start, the return on investment ranges from seven to nine dollars. Head Start graduates are also more likely to graduate from high school. The federally funded Early Head Start program promotes healthy child development and sets the foundation for success in kindergarten. Early learning programs benefit more than young children – they serve the needs of the whole family and community. “West Chicago and Addison are also experiencing high teen pregnancy rates, and early childhood education is an important tool to help teen moms stay in school,” Nihill said.